Viceroy’s House is a historical drama about the establishment of Indian Independence in 1947 and the end of the British Raj. Released in both English and Hindi language versions, the film was directed by Gurinder Chadha, whose own grandmother was caught up in the chaos of the catastrophic Indian Partition that took place at that time. The general subject matter of the film is both fascinating and disturbing. At the time of Indian independence and the partition of the subcontinent into two mutually hostile nations, India and Pakistan, the violence that ensued was one of the greatest humanitarian catastrophes in world history [1,2]. Roughly one million civilians were killed during these disturbances (with some estimates ranging as high as two million ), and 75,000 women were raped, a great many of whom were murdered and disfigured [3,4]. In addition some 14 million people – roughly half of them Muslims and the other half Hindus and Sikhs – were made homeless and had to rush with few belongings to safer harbors across the borders. As William Dalrymple described it, the tragedy was a “mutual genocide” . The lasting legacy of this tragedy continues to haunt the Indian subcontinent, just as the American Civil War continues to haunt the US to this day. The machinations on the British side of things, at the center of which was the last British Viceroy of India, Lord Louis Mountbatten. Chadha has chosen to focus her film on the latter aspect of this tale, with a particular portrayal of the final days of British pomp and ceremonial overlordship in the country. The other elements, which to me are more fascinating, are only briefly alluded to. As such, and given the fact that Chadha has tried to cover the various social levels within the Viceroy’s Indian residence, the film has a flavor reminiscent of popular British TV series Upstairs, Downstairs (1971-75) and Downton Abbey (2011-2016). 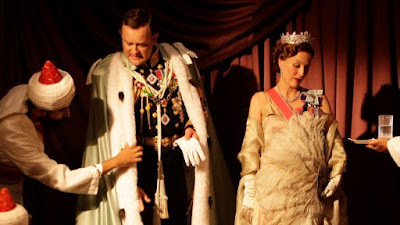 In fact the connection with Downton Abbey is enhanced by the fact that Hugh Bonneville, who played the lead role in Downton Abbey, plays as a somewhat similar role as Lord Mountbatten in this film. Much of the historical material for Viceroy’s House is drawn from two books on the topic, Freedom at Midnight (1975), by Larry Collins and Dominique Lapierre , and The Shadow of the Great Game: The Untold Story of India's Partition (2006), by Narendra Singh Sarila [6,7]. Both books are based on sources with direct, personal access to Lord Mountbatten, so they are presumed to carry a level of authenticity on the viceregal side of things. Freedom at Midnight has a wider scope than this film, including much more material with respect to Gandhi’s activities, but thankfully Ms. Chadha managed to avoid Collins’ and Lapierre’s sometimes patronizing tone . As it is, the narrative in Viceroy’s House” is more confined to the Downton-Abbey-style social side of things. This includes, for example, the efforts of Lady Edwina Mountbatten (played by Gillian Anderson, who was famous for her role in the TV series The X-Files” (1993-2002) and who recently played in the mini-series War and Peace (2016)) to include traditional Indian cuisine in the custom-bound and archly stiff viceregal dinner menus. The sumptuousness of the Viceroy’s house is literally there, since the film was shot in the original dwelling. Even though the grandeur of the building is evident, it was still surprising for me to learn that this was one of the largest palaces in world history . On the “downstairs” level of the Viceroy’s House narrative, there is a presentation of a hopeless romance between two servants from “opposing” religious backgrounds – Jeet (Manish Dayal; The Hundred-Foot Journey, 2014), who is a Hindu manservant in the mansion, and Aalia (Huma Qureshi), who is Jeet’s former childhood friend and who is a Muslim. These are not really star-crossed lovers in the fashion of Romeo and Juliet, since the romance never really gets off the ground – Alia is already betrothed to someone else. In any case this particular narrative thread fails to develop any traction and gradually becomes tedious . More interesting is what goes on “upstairs”, especially the too-brief interactions we get to see between Lord Mountbatten and his Indian counterparts with whom he has to negotiate – Gandhi (Neeraj Kabi), Nehru (Tanveer Ghani), and Jinnah (Denzil Smith). All three of them generally look the part. 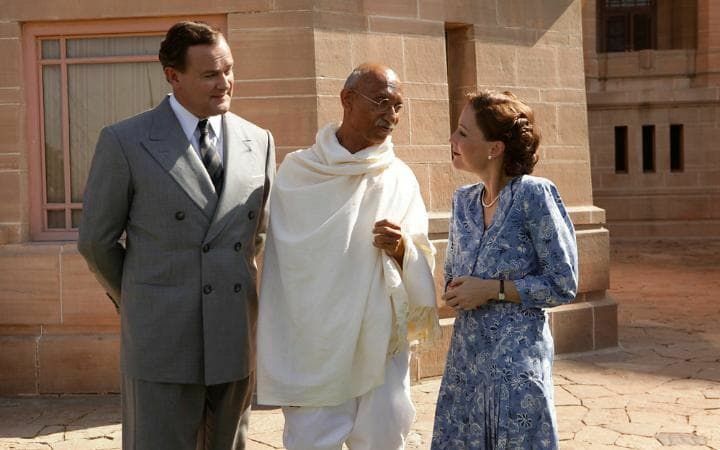 However, Neeraj Kabi seems too tall for the role of Gandhi, who I understand was only five feet tall (and I would guess that Gandhi’s small physical stature was an important part of the humble presence he made before other people). And Nehru’s reportedly charismatic personality is not much in evidence here. In addition, it is not surprising, given the film’s intended general audience, that Ms. Chadha left out any references to Nehru’s alleged affair with Lady Mountbatten. And, of course, the remote and austere Muhammad Ali Jinnah is a fascinating but inevitably mysterious character. Interestingly, the Muslim League at the start of the world war did not even represent a quarter of Muslim voters, yet it was able to demand the partition of the nation on religious lines at the end of it . We also learn that the British government back in England, since Winston Churchill’s time, actually secretly preferred to have an independent Pakistan established. This was because it was felt in some quarters that, given Nehru’s socialist sympathies, Pakistan would be more likely than India to cooperate with Great Britain’s efforts to stop Communist Russia from securing a warm-water (i.e. never iced-up) seaport in what is now southern Pakistan . So the British went ahead with a hastily conceived plan to partition. And the crucial maps setting the boundary separating India and Pakistan were drawn up in 1947 by Cyril Radcliffe, who had never visited India in his life before being appointed as the chairman of the Boundary Commission . Of course, if there hadn’t been a partitioning, it is possible that a united India might have been so unstable that it would have disastrously disintegrated into a perpetually hostile collection of warlord states with even greater casualties. What we do know is that the India that did result has been a remarkable multicultural success. Today, more than fourteen percent of its population is Muslim, and it ranks third on the list of countries with the greatest number of Muslims. It has persisted for seventy years as the world’s largest democracy, encompassing almost a one-sixth of the world’s population and standing as a monument for the rest of humanity. Viceroy’s House is only intermittently successful in telling this story, but it does give a glimpse of that notable period when modern India took shape, and it may be of interest so some viewers. Ved Mehta, Face to Face: The Autobiography of a Young Indian, Blind from Childhood, (1958), Collins. Ved Mehta, Portrait of India, (1970), Farrar Straus & Giroux. William Dalrymple, “The Great Divide – The Violent Legacy of Indian Partition”, The New Yorker, (29 June 2015). Larry Collins and Dominique Lapierre, Freedom at Midnight, (1975) William Collins & Co., Ltd.
Narendra Singh Sarila, The Shadow of the Great Game: The Untold Story of India's Partition, (2006), HarperCollins. Jad Adams, “The Ill-fated Battle for Indian Independence”, The Telegraph, (28 Aug 2006). For example, “He [Mountbatten] had surrounded himself with trappings of imperial grandeur that so delighted India’s masses . . . “ (p. 94). Guy Lodge, “Berlin Film Review: ‘Viceroy’s House’”, Variety, (6 February 2017). Larry Collins and Dominique Lapierre, op cit., p. 36.